Bonaduz, Switzerland & Irvine, California – October 12, 2012 – HAMILTON MEDICAL AG, a leader in intensive care ventilators and closed-loop technology, and Masimo (NASDAQ: MASI), the inventor of breakthrough SET® Measure-Through Motion and Low Perfusion pulse oximetry, announced today a purchasing and licensing agreement, and associated international launch of the integration of Masimo's blood oxygenation (SpO2) measurement technology with HAMILTON MEDICAL's fully closed-loop mechanical ventilation systems. INTELLiVENT®-ASV is the world's first fully closed-loop ventilation solution, automating ventilation and oxygenation in one system. HAMILTON MEDICAL will unveil the new system integration, available in HAMILTON-S1 and HAMILTON-G5 ICU ventilators, at the European Society of Intensive Care Medicine (ESICM) LIVES 2012 congress in Lisbon, Portugal, October 13-17, at exhibit booth 23. 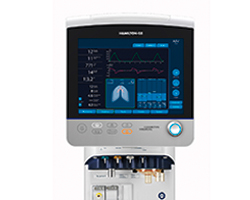 With the integration of Masimo SET® extended measurement options, HAMILTON MEDICAL enhances its ventilation support options for the innovative HAMILTON-S1 and HAMILTON-G5 ventilators. This offers clinicians the choice of using an SpO2 technology that they are used to working with. Masimo SET® has been proven to provide accurate SpO2 values under real-world challenging conditions, including patient motion, patient transport, and low perfusion. "This performance is of great benefit to INTELLiVENT®-ASV closed-loop operation," said Jens Hallek, VP and COO of HAMILTON MEDICAL AG in Bonaduz. The integration of Masimo SET® with HAMILTON MEDICAL ventilators expands the options for SpO2 technologies. SpO2 measurements are used by INTELLiVENT®-ASV, and are also available separately as monitored parameters. HAMILTON MEDICAL increases the ease of use with a dedicated sensor adapter for Masimo. The adapter mounts easily on all standard rails and includes a storage position for CAPNOSTAT® CO2 sensors. It also offers the ability to manage the SpO2 and CO2 sensor cables to avoid cable entanglements. HAMILTON MEDICAL was founded from a passion with the goal of improving the lives of patients on respirators and the people who care for them. Since 1983, our commitment to innovation has resulted in creative solutions such as ultrafast valve technology, on-airway flow sensing, lung function graphics monitoring, pulmonary parameter monitoring, the world's first closed-loop controlled ventilation mode, Adaptive Support Ventilation (ASV®), and the systematic evolution of ASV: INTELLiVENT®-ASV. HAMILTON MEDICAL specializes in the design and development of ventilation equipment for patients ranging from neonates to adults. Innovative Intelligent Ventilation Solutions, such as Adaptive Support Ventilation (ASV®), invented by HAMILTON MEDICAL, are part of its mission to deliver a unique combination of: Ease of use, improved patient outcomes, and efficiency through innovation. HAMILTON MEDICAL AG is a privately owned Swiss company. Masimo (NASDAQ: MASI) is the global leader in innovative noninvasive monitoring technologies that significantly improve patient care—helping solve "unsolvable" problems. In 1995, the company debuted Measure-Through Motion and Low Perfusion pulse oximetry, known as Masimo SET®, which virtually eliminated false alarms and increased pulse oximetry's ability to detect life-threatening events. More than 100 independent and objective studies have shown that Masimo SET® outperforms other pulse oximetry technologies, even under the most challenging clinical conditions, including patient motion and low peripheral perfusion. In 2005, Masimo introduced rainbow SET® Pulse CO-Oximetry technology, allowing noninvasive and continuous monitoring of blood constituents that previously required invasive procedures, including total hemoglobin (SpHb®), oxygen content (SpOCTM), carboxyhemoglobin (SpCO®), methemoglobin (SpMet®), and Pleth Variability Index (PVI®), in addition to SpO2, pulse rate, and perfusion index (PI). Additional information about Masimo and its products may be found at www.masimo.com. This press release includes forward-looking statements as defined in Section 27A of the Securities Act of 1933 and Section 21E of the Securities Exchange Act of 1934, in connection with the Private Securities Litigation Reform Act of 1995. These forward-looking statements are based on current expectations about future events affecting us and are subject to risks and uncertainties, all of which are difficult to predict and many of which are beyond our control and could cause our actual results to differ materially and adversely from those expressed in our forward-looking statements as a result of various risk factors, including, but not limited to: Masimo's pulse oximetry technology is able to provide accurate SpO2 values even in difficult circumstances, such as during patient motion or movement and low perfusion; as well as other factors discussed in the "Risk Factors" section of our most recent reports filed with the Securities and Exchange Commission (SEC), which may be obtained for free at the SEC's website at www.sec.gov. Although we believe that the expectations reflected in our forward-looking statements are reasonable, we do not know whether our expectations will prove correct. All forward-looking statements included in this press release are expressly qualified in their entirety by the foregoing cautionary statements. You are cautioned not to place undue reliance on these forward-looking statements, which speak only as of today's date. We do not undertake any obligation to update, amend or clarify these statements or the "Risk Factors" contained in our most recent reports filed with the SEC, whether as a result of new information, future events or otherwise, except as may be required under the applicable securities laws.